The Addicted to Holos October box has arrived and it's packed full of pretty polishes! 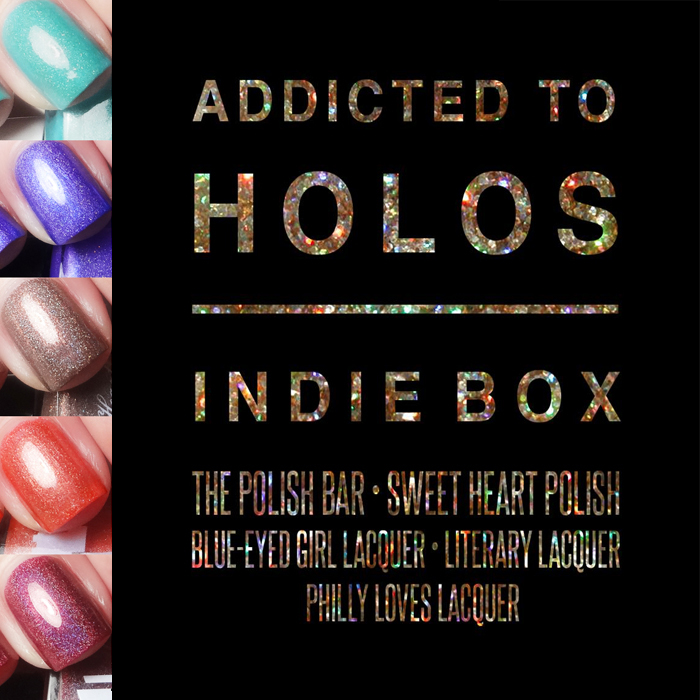 Addicted to Holos is a bi-monthly box featuring holographic polishes from Blue-Eyed Girl Lacquer, Literary Lacquer, Philly Loves Lacquer, Sweet Heart Polish & The Polish Bar. The boxes are available for purchase via a week-long preorder at the beginning of every other month. The cost was recently reduced to $50 plus shipping. A coralesque orange linear holo with gold flash and copper shimmer. A pumpkin orange, right in time for fall. The gold and copper shimmers are pretty but the holo was difficult for me to see. The holo appears to be more scattered and sparse. The formula on this polish was better than most PLLs I've tried in the past. It was fluid and easy to apply. I wore two coats and topcoat. A medium purple linear holographic with tiny pewter holographic glitter. Mint jelly linear holo with gold and pink glass flecks. I consider this shade more of a sea foamy green than mint since it leans blue. More like the shade of a Tiffany jewelry box. 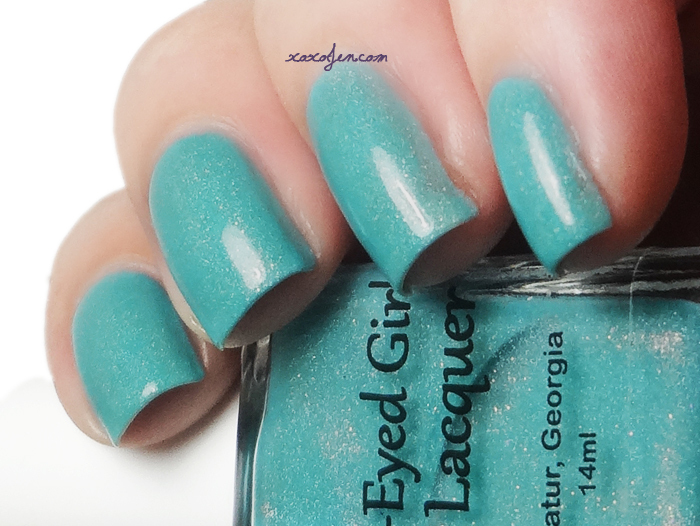 I really enjoyed the sparkle of the glass flecks while wearing this polish. The holo in this one was subtle, but there is definitely a rainbow on the nail. Almost opaque in one coat so I went for two. The formula is nice and easy to apply. 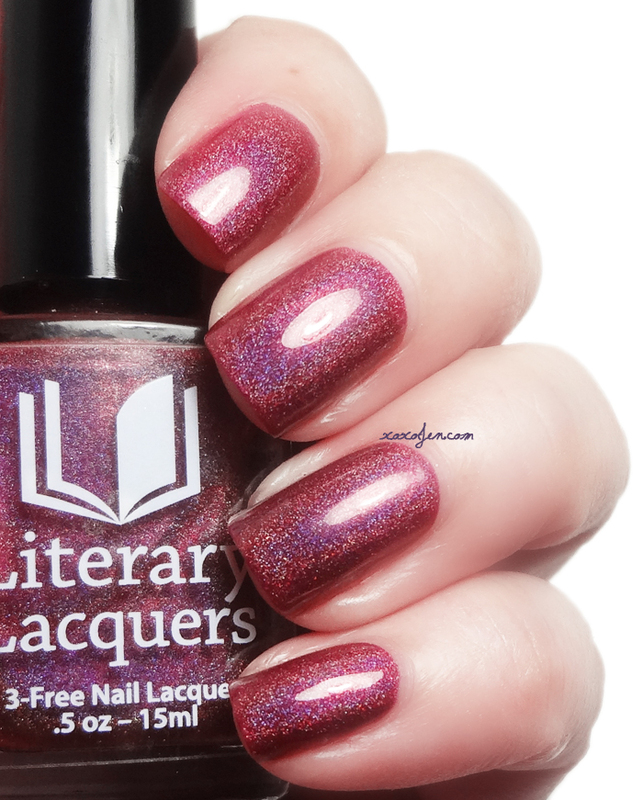 A black cherry linear holo (inspired by Shakespeare's Sonnet XIX). I love black cherry flavored things and when I saw the description of this polish I craved the Kool-Aid. -giggle- A nice strong linear holo effect, the kind that I love! I wore two coats of this buttery formula. A warm brown linear holographic with a pink flash and copper holographic glitter. Milk Chocolate, smooth creamy but with sparkles! A glistening dessert, that is this polish. Two easy coats that applied themselves and just look at that sparkle! The Addicted to Holos box for October will be available for preorder at http://www.addictedtoholos.bigcartel.com/ from 10/5/2015 through 10/12/2015. All polishes in the box are limited edition and only available for the month they are offered. These are some great holos for October's box.